Short on time? Follow this link to a Google Maps version of our Zihuatanejo guide with all of our favorite spots labeled! You can “follow” the guide, and the saved locations will automatically transfer to your own Google Maps account. Last weekend, Tyler and I sprinted away from reality, straight into the arms of the white sand and mango margaritas of Zihuatanejo. You might remember Zihuatanejo as the paradise that Andy dreamt of and finally escaped to in The Shawshank Redemption. This sleepy fishing town is nestled on the Pacific coast of Guerrero, Mexico, and neighbors a plush and sterile resort town called Ixtapa (will discuss Ixtapa later). “Zihua” is known for its kind, light-hearted locals and near-perfect beaches, and it did not disappoint in either regard. Neither of us had ever done a “beachy” vacation before this. I mean, I grew up clumsily trotting through campgrounds in the middle of the night, holding a flashlight as big as my body, trying to find the bathroom before the bears found me. And Tyler and I haven’t gone on a relaxing tropical vacation since we’ve been married. This was our first time going somewhere just for the beach. We spent most of our four days wading in the perfect temperature water at Playa La Ropa, drinking green juice after green juice, and shoveling buckets of chips and salsa into our mouths. Sometimes your dream vacay has a few hiccups. Ours just happened to have the kind of aggressive hiccups that make everyone in the restaurant turn and stare in concern. A few examples. On our second day, we accidentally joined a tour that turned out to be an absurd waste of money and time, and we had to full on break up with our tour guide. On our third day, a red-eyed canine, who I’m positive was rabid (Tyler thinks otherwise), kept showing up, causing more than a little alarm with no Atticus Finch to save us. And then Tyler got super sick the second-to-last night night we were there. We spent most of our last day alternating dips in the pool with episodes of Modern Family. While some of our hiccups were unavoidable, I’m including the ones that you can learn from in the following list of recommendations. 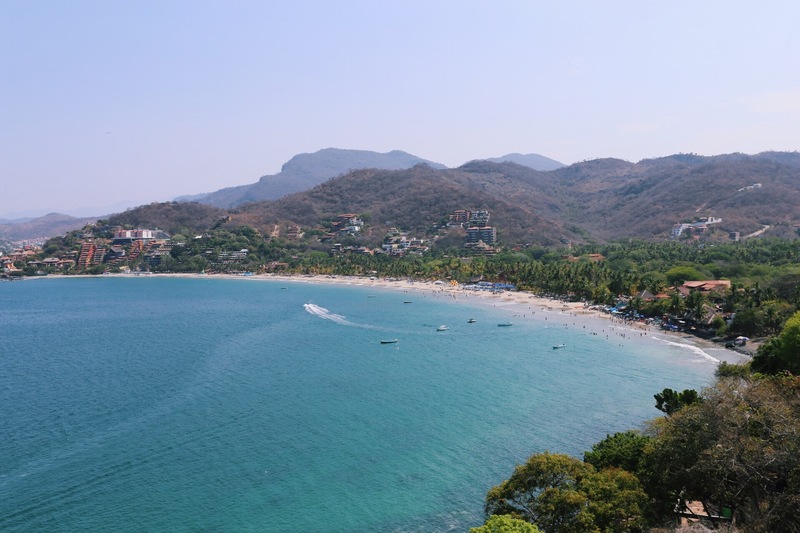 Online resources about Zihuatanejo were extremely limited, so we wanted to put together a guide of things to know while you are planning your trip. One of the huge benefits of choosing Zihua as your beach getaway is that it is a quick three-hour plane ride from LAX. We found the Alaska Airlines flight much cheaper than other options, and we had a great experience. You can read more about how we paid for the flights here. The Ixtapa-Zihuatanejo airport is really close to everything. It only took 20 minutes for us to cab from the airport to where we stayed at Playa La Ropa. Zihuatanejo is a colorful and friendly fishing town, full of history and culture. In the 1970’s, the Mexican government commissioned a resort town next to it to boost tourism. Enter Ixtapa, an antiseptic strip of resorts that draws loads of tourists to the region every year. Ixtapa left something to be desired, in our opinion. We much prefered Zihua with its cobblestone streets, lively restaurants, and authentic atmosphere. If you’re heading to the area and trying to decide between the two towns, we suggest staying in Zihua. We spent most of the trip sweating buckets. My hair was a LION, and Tyler was constantly soaked. It was very warm. And very humid. We were there in late May, but apparently the weather is flawless in January, February, and March. We highly recommend going during that time frame, when it’s dry (but still perfectly warm out) to experience the best weather in Zihuatanejo. Half of the people we talked to spoke some English, and the other half spoke none at all. I’m sure you could manage without much working knowledge, but it will definitely make your life easier if you can memorize a few key phrases. Download Duolingo to practice your Spanish before you take off, and you can use TripLingo to help translate while you are there. There are plenty of beaches to choose from in this area. We advise staying away from Playa Principal, the main beach, unless you need to go to the pier to join a sunset cruise or fishing excursion. Our favorite beach was Playa La Ropa, just steps away from where we stayed. Rows and rows of palm trees line the curved strip of beach, and the sand was so soft it almost felt fake. There is an overwhelming number of beachside restaurants on Playa La Ropa, but we posted up at La Perla every day at 5pm. The piña coladas here were INCREDIBLE, and you know we embarrassed ourselves with the amount of guacamole we ordered over the course of the weekend. You can also pay $5 USD at La Perla to rent beach chairs and an umbrella for the day. PER USUAL, our favorite part about this trip was the food. We had some really incredible dinners in Zihua, all made with fresh ingredients and always with the best service. Friday nights at 10pm, head to Bandido’s for salsa dancing and salsa, freshly made next to your table. We loved the atmosphere and garden setting at El Vigía (try the steak and homemade chocolate ice cream!). And you definitely cannot miss the blackened tuna with sesame seeds at El Manglar. Don’t be alarmed by the crocodile lurking in the lagoon next to the patio. We spent a ton of time researching and booking activities for our time in Zihua before we got there. Normally we do suggest planning out your time before you get to your destination, but we didn’t know what we were getting ourselves into with some of these activities. For example, we signed up for a “sailboat sunset cruise” before we got to Zihua for the first night we were there. We arrived at Playa Principal ready to sail the evening away and discovered that our “sailboat” was actually a dinky, covered motorboat that looked like it was built in about 1702. We apologized to the captain and dipped out. The point is, don’t feel like you need to map out every single second. Get there first and assess the situation. THEN decide how you want to spend your time. A lot of the activities are marketed online as way more impressive than they really are. The only real exception to this is if you want to horseback ride because you’ll have to make an appointment for that (we booked with Ixtapa Tours Luis and enjoyed the experience). I wasn’t as into the horseback riding as Tyler was, but my favorite part of doing that was riding on Playa Blanca, a HUGE gorgeous beach that was basically deserted. Besides the aforementioned equestrian experience, we recommend getting your bearings before you commit to anything. We went to LOOT every day we were in Zihua. We loved this hip coffee shop/art gallery/surf and its huge patio covered with gorgeous tropical plants. Escape the dripping heat under the shelter of the mist fans and comfy couches, and order a “jugo verde” or iced coffee. We loved the avocado toast here, too. We weren’t obsessed with the food at the Pacifica Grand Zihuatanejo, and they will undoubtedly try to sell you a timeshare if you make eye contact with a staff member on your way in. The deck from the restaurant, though, has THE most amazing view of Zihuatanejo Bay. It’s worth the short trip up the hill to grab a fruity drink and enjoy the view at sunset. If Tyler was feeling better, we planned on renting a jet ski from Playa La Ropa and taking it around the bay, and stopping at the secluded beach, Playa Las Gatas for an afternoon. If you are prone to motion sickness like I am, there is also a walking bath from Playa La Ropa. We had the great benefit of staying at our good friends’ condo, which was a 3 minute walk to Playa La Ropa and outfit with a private community pool. If you’re not so fortunate, the best option is, no question, Viceroy Zihuatanejo, which is right on the beach with beautiful accomodations. For a truly “local” experience, we recommend renting an apartment or condo through Airbnb. Use this link to get $40 off your first stay. We had a great time learning to “relax” in Zihua, and we hope you love practicing your Spanish and the fun beaches as much as we did. Let us know how it goes!! If you found this post helpful, relevant, or entertaining, we’d absolutely love it if you chose to follow along on Instagram. Literally dying at the rabid dog sentence and also that sounds awful. Pinning this post! Love it. Awesome! We hope you had a wonderful time. I wish we were back there right now!! My time in Mexico was spent with a terrible upset stomach. It lasted 3 weeks after returning home. Paregoric followed and finally got rid of it. I was told it was something I contracted through the water or fruit from the buffet breakfast. I really would love to go to Zihuatanejo. Should I be concerned about contracting the horrible stomach yuck? Hi Lisa! Thanks for stopping by and for the kind words. That sounds absolutely terrible, and I’m so sorry to hear that you got so sick!! While we didn’t have any problems while we were there, definitely do your research to make sure. We did steer clear of the drinking water–bought bottles everywhere and got a case of water bottles right when we got there to keep at our place. I hope this helps! On a positive note, your kid is very cute, and regardless how you make it work. Very nice website. Nice story. I live in Zihua…have so for 35there are better options. Enjoy.years. Playa La Ropa is my home here. Hotel Viceroy is the most expnsive hotel on our beach.